Whilst I can say that I personally quite enjoyed the title for it’s story, it’s not for everyone; some people don’t consider such titles to be ‘games’ at all, and some absolutely hate them. However, this post is not a review. If you want to know more about The Bunker, please check out the title’s Metacritic page for a whole host of reviews and scores. I thought this was strange as your character is the only person present in the game. This figure appears nowhere else in the game, and doesn’t feature in the story anywhere at all. 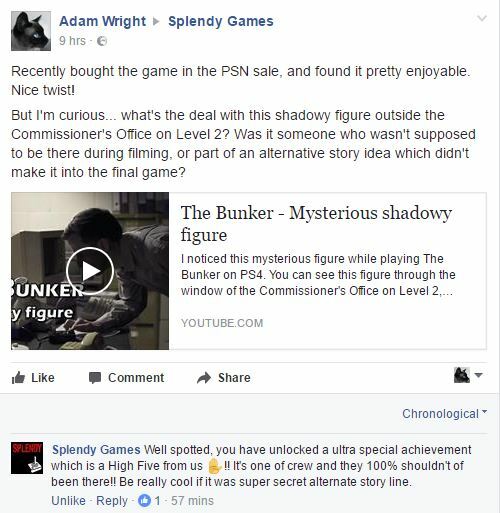 Was it perhaps part of an unused alternative story line or plot device which didn’t make it into the final game? Curious, I turned to Google in the hope of finding an explanation, but – while I don’t claim to be the first or only person to have noticed this figure – I could find no mention of it. 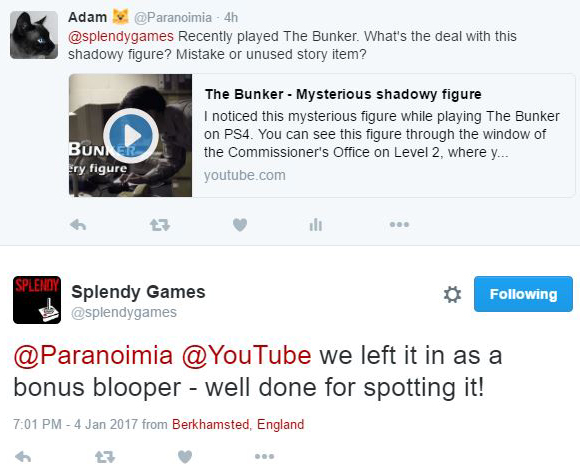 So I looked up Splendy Games Twitter and Facebook accounts, and asked them directly. Sadly, it seems it was nothing as elaborate as an unused story line, and was merely a member of the crew caught in the wrong place at the wrong time. So as the saying goes, the most obvious answer is often the correct one.